San Anselmo First Presbyterian Church Tuesdays and Thursday Nights 6:15 – 7:00 PM – Tuition billed monthly, $8 discount for Autopay. Tai Chi Push Hands, or Tui Shou, is the most distinctive and well known partner exercises of Tai Chi. Tui Shou is translated as both “pushing hands” the literal translation, and either “sensing hands”or “listening hands” as more descriptive translation. The game of push hands is to off balance your partner using no more than 4 ounces of pressure. Along the way a diverse series practice exercises are used to develop the fundamental skills required to play the game of Tui Shou well. Tai Chi Push Hands, or Tui Shou, is the most distinctive and well known partner exercises of Tai Chi. Tui Shou is translated as both “pushing hands” the literal translation, and either “sensing hands”or “listening hands” as a more descriptive translation. The game of push hands is to off balance your partner using no more than 4 ounces of pressure. Along the way a diverse series practice exercises are used to develop the fundamental skills required to play the game of Tui Shou well. Push Hands is safe fun game and partner exercise to deepen your understanding and skill in Tai Chi Chuan. Push Hands focuses on learning how to use the four most important techniques of Tai Chi the Ward Off, Roll Back, Push, and Press. These four moves are performed more than any others in the longer and older Tai Chi Forms. Ward Off is the simplest and most fundamental defensive movement. Your raise your arm to “Ward Off” the opponents blow. This technique is also called Peng in Mandarin and represents expanding energy. The energy that floats a boat or inflates a ball. If the structure and body alignment of your Ward Off is correct it will in fact have great strength without excessive tension. Everyone learns how to correctly do Ward Off so they can effectively use it for self defense. We do make sure your ward off is strong and you will know it is from personal experience in practice. 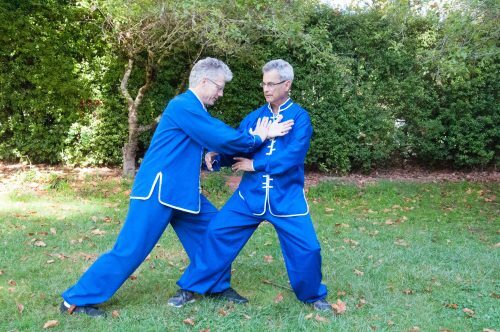 Learning the feeling of “Peng” in push hands changes how you perform every movement in the Tai Chi Form because all of the movements in Tai Chi are should contain this feeling to create the shape and fill the energy of each posture. Roll Back is the other defensive movement in Tai Chi. Roll Back in its most fundamental essence is a retreating and deflecting movement using primarily forearm rotation and contact. Roll Back is also a method to attack the elbow joint called “Split The Elbow”. It is a powerful self defense tool that is non lethal. In push Hands you learn how to safely practice this technique with your partner and also how to defend against it, and evade it. Press is a short range strike that can be used to Off Balance your partner without using force. Press is often done as a counter to Roll Back. Press is an excellent movement to learn how to evade and counter when your partner or opponent is in very close range. Push is the offensive technique in Push Hands and is used to off balance or uproot the opponent. The Push can also be viewed as a double pal strike to the opponents chest. In push hands the goal is to use no more than four ounces of pressure and still launch your partner flying many feet to the rear. An expert push is light as feather, yet propels the other a long ways. People rarely fall during these exercises because everyone is being careful and practicing being aware. A good strong push actually a very effective self defense technique. If you really knock the opponent down or into obstacles and or others you can end the fight or sadly make your escape without legal consequences. More than one of my students has used the humble push to defend themselves or others in real situations. Balance – Tui Shou practice incredibly improves your balance immediately. Without feedback it is easy to fool oneself into thinking their balance is better than it is. With your partner constantly training you in how to maintain your balance you balance gets fantastic quickly. In Tai Chi we like to learn rooting and grounding. These terms describe becoming impossible to push like a huge tree rooted in the earth or mountain. You learn these skills by perfecting your leg and knee alignment and learning how to sink your hips and move with a flexible responsive waist. These skills really improve your solo form and help you learn how to “Sink Your Qi”. Relaxation – In push hands, if your body is tense you are stiff, brittle, and easy off balanced. In practice you’ll loosen up and relax quickly to avoid being constantly off balance. It is a really fun game and every one has a great time! We enter Push Hands competitions at every opportunity when we compete in tournaments with our Tai Chi Team, San Shou Team, and Kung Fu Team. This class is open to all Tai Chi friends regardless of style or past experience. You do not need to learn the Yang Family Long Form that I teach before joining this class. If you know another Tia Chi Form that is terrific. However, even if you don’t know any Tia Chi and practice other martial arts you are welcome to attend this class and learn Push Hands with us and have a great time. Students of Xing Yi Quan and Ba Gua Zhang also find these exercises extremely helpful to improving their mastery of those arts. 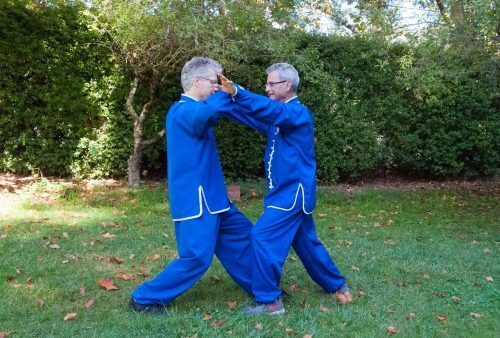 This is particularly true because of my own experience learning Xing Yi Quan and Ba Gua Zhang and my inclusion of incredibly complimentary exercises form those disciplines into this class.